High-tech Barbarism:: Look! Up in the Sky! It’s a Bird… It’s a Plane… It’s a Raytheon Spy Blimp! Imported from America’s aggressive wars of conquest in Iraq and Afghanistan and now deployed in the heimat, sprawling intelligence and security bureaucracies have teamed-up with corporate scofflaws to fill a market niche, inflating the bottom-line at the expense of a cherished freedom: the right to be left alone. But as Antifascist Calling has noted many times, “what happens in Vegas” certainly doesn’t stay there, a point driven home by Raytheon. Along with a suite of sensors and high resolution video cameras, RAID’s digitized mapping tools are similar to those developed for the National Geospatial-Intelligence Agency (NGA). In tandem with a preprogrammed mapping grid of the target location, the system can scan a wide area and relay video clips to a centralized command center. Captured data known as GEOINT, or geospatial intelligence, is “tailored for customer-specific solutions” according to NGA. That agency along with its “sister” organization, the National Reconnaissance Office (NRO), the super-secret agency that develops and flies America’s fleet of spy satellites are also among the most heavily-outsourced departments in the so-called Intelligence Community. As investigative journalist Tim Shorrock points out in his essential book, Spies For Hire, giant defense firms such as Raytheon and Northrop Grumman “with assistance from Republican lawmakers from the House Intelligence Committee,” helped launch a lobby shop for the industry in 2004, the United States Geospatial Intelligence Foundation (USGIF). Self-described as a “not-for-profit educational foundation,” USGIF “is the only organization dedicated to promoting the geospatial intelligence tradecraft and building a stronger community of interest across industry, academia, government, professional organizations and individual stakeholders.” Since its formation, USGIF has expanded to some 154 companies and state agencies and has an annual budget that exceeds $1 million. “Strategic partners” include the usual suspects, corporate heavy-hitters such as Northrop Grumman, Raytheon, Science Applications International Corporation, Boeing, Booz Allen Hamilton, Lockheed Martin, BAE Systems, IBM, Google, AT&T, Microsoft, The MITRE Corporation, and L3 Communications. Additionally, niche companies such as Analytical Graphics, Inc., DigitalGlobe, GeoEye, Intergraph, PCI Geomatics, TechniGraphics, Inc., flesh-out USGIF’s roster. In this context, the public roll-out of RAID is all the more pressing for securocrats and the companies they serve since Homeland Security Secretary Janet Napolitano “plans to kill a program begun by the Bush administration that would use U.S. spy satellites for domestic security and law enforcement,” the Associated Press reported June 22. That program, the National Applications Office (NAO) was first announced by the Bush regime in 2007 and was mired in controversy from the get-go. As Antifascist Calling reported last year, NAO would coordinate how domestic law enforcement and “disaster relief” agencies such as FEMA utilize GEOINT and imagery intelligence (IMINT) generated by U.S. spy satellites. But as with other heimat security schemes there was little in the way of oversight and zero concern for the rights of the American people. The intrusiveness of the program was so severe that even Rep. Jane Harman (D-CA), the author of the despicable “Violent Radicalization and Homegrown Terrorism Prevention Act of 2007” (H.R. 1955) vowed to pull the plug. Chairwoman of the Homeland Security Committee’s Intelligence, Information Sharing and Terrorism Risk Assessment subcommittee, Harman introduced legislation earlier this month that would have shut down NAO immediately while prohibiting the agency from spending money on NAO or similar programs. Perhaps those “pressing priorities” could be better served by a low-key approach, say the deployment of a system such as RAID? After all, what’s so threatening about a blimp? It comes as no surprise then, that the next target for Raytheon marketeers are precisely local police departments and sports facilities “that want to keep an eye on crowds that might easily morph into an unruly mob,” as Newsweek delicately put it. However, Raytheon’s slimmed-down surveillance airship is a spin-off from a larger Pentagon project. Among other high-tech, privacy-killing tools currently under development is the Defense Advanced Research Project Agency’s (DARPA) Integrated Sensor Is Structure (ISIS) program. As conceived by the agency, ISIS will be a high-altitude autonomous airship built for the U.S. Air Force that can operate at 70,000 feet and stay aloft for a decade. 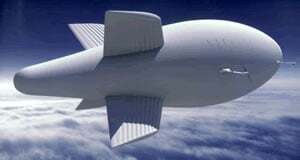 Operating six miles above the earth’s surface, well out of range of surface-to-air missiles, the airship will be some 450 feet long, powered by hydrogen fuel cells and packed with electronic surveillance gear and radar currently being field-tested by Raytheon. Projects such as ISIS reflect a shift in Pentagon planning and spending priorities. Under Bush regime holdover, Defense Secretary Robert Gates, the military plans to leverage America’s technological advantage to improve intelligence and surveillance capabilities at the expense of over-inflated big ticket items such as the F-22 Raptor or new Navy destroyers. Gates and others in the Pentagon believe a shift towards “robust ISR platforms” will better facilitate the Pentagon’s new paradigm: waging multiple, counterinsurgency wars of conquest to secure natural resources and strategic advantage vis-à-vis imperialism’s geopolitical rivals. But military might and technological preeminence, however formidable, represented by the Pentagon’s quixotic quest for total “situational awareness” promised by platforms such as ISIS and RAID, will no more ameliorate the Empire’s extreme political weakness than putting a band-aid over a gangrenous lesion changes the outcome for a dying patient.